Michael Brandon Smith was standing in his driveway one afternoon, beer in one hand and laser pointer in the other. Bored, he decided to see if the pocket-sized novelty could reach the helicopter passing overhead. It could. He knew because a short time later, police were knocking on Smith’s door. Not long after that, Smith was sentenced to two months of house arrest and two years’ probation. The helicopter was a St. Louis police transport responding to a burglary call; it had to divert when the laser pointer temporarily disoriented its occupants. Ever since laser pointers were introduced as a cheap, consumer-use trinket in the 1990s, there’s been a human tendency to point them at things: other people, animals, and, more recently, aircraft. While driving Mr. Mittens to exhaustion with a dot can be fun, the latter is a federal offense and quite possibly the lamest explanation you could ever give to another inmate. That "weak” light originating from the ground not only reaches the cockpit of planes, it’s also magnified considerably by their Plexiglas windows. The pilot’s field of vision is compromised as the light comes in bursts, a strobe effect the FBI has compared to setting off a camera flash in a dark room. At distances of up to 1200 feet, it can engulf a cockpit. It remains a distraction hazard all the way up to 12,000 feet. While the practice has yet to result in an accident, pilots have been forced to change course; more than 35 have required medical attention, which is why both the Federal Aviation Administration (FAA) and the FBI have taken extraordinary measures to try and dissuade people from pointing them at planes—a bizarre habit officials have called “lasing” that resulted in nearly 4000 reported cases in 2013 alone. Smith was using a consumer-grade pointer; the FBI looks unkindly towards anyone using a commercial model. 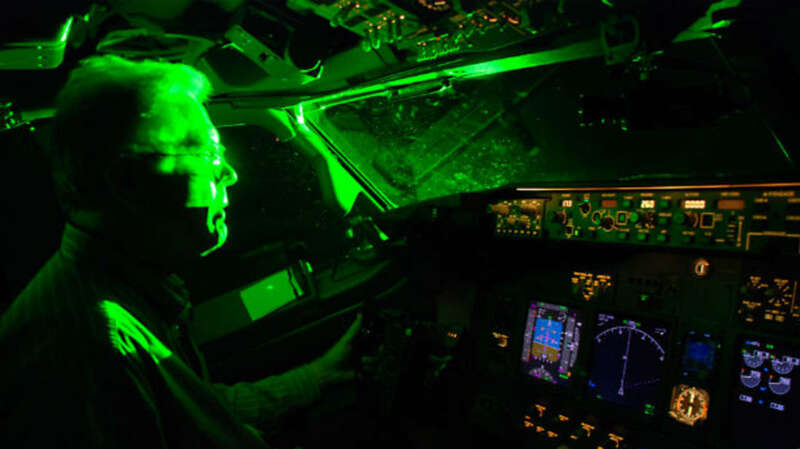 (Though legal to own, they’re not intended to be marketed as “pointers.”) In 2012, 19-year-old Adam Gardenhire received 30 months in federal prison for distracting pilots with a powerful laser. That same year, Sergio Rodriguez was arrested for the same crime, using a device 13 times more potent than the norm. He got 14 years. Some lawmakers want to see pointers greater than 5 mW banned outright. Charles Schumer, U.S Senator from New York, called for their prohibition after four planes at La Guardia were targeted last May. That probably wouldn’t go over well with laser enthusiasts who use units up to 1000 mW (1 watt) for science experiments. In New South Wales, Australia, where pointers above 1 mW have been banned since 2008, a black market has cropped up, potentially making the situation worse: high-powered lasers are being imported and sold as low-watt units. Because pinpointing offenders can be difficult, the FBI offers a $10,000 reward for information leading to a laser-related arrest.